Enact The Emergency Measures To Protect Orcas Now! The Canadian Federal Court of Appeal has ruled against the federal government’s approval of the Trans Mountain pipeline project. The Court’s position was that it was never approved legally in the first place. As it stands now this controversial pipeline cannot be built. This decision could regain confidence in a political system that often is less than honest. It will stop millions of tonnes of additional greenhouse gas emissions from polluting our planet. It will help stop the continuous use of dirty energy instead of clean energy. The court also unanimously ruled that the federal government’s approval of the project violated its legal obligations to protect endangered orcas under the Species at Risk Act. More to follow about Lifeforce's work to get the Canadian government Enacting Emergency Measures under SARA to protect orcas. Saving J50 must not put all orcas at risk. The Southern Resident Killer Whales (SRKW) must not be treated like lab guinea pigs that can result in unknown threats to them. Species at Risk Emergency Orders must include the immediate moratoriums on salmon fishing and increased enforcement to stop boat harassment. 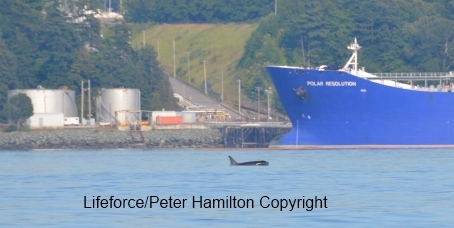 The lack of salmon caused by the broken ocean food chain and vessel harassment continues. In 2018 Lifeforce has reported numerous boaters not adhering to the 200 meter law. Lifefeforce has urged DFO and NOAA to not put any antibiotics into the salmon. The salmon cannot be targeted to be consumed by only J50. The risk to J50 is an issue but the risks to all resident orcas must not be allowed. Emergency Measures Must Be Enacted Now! Lifeforce has been fighting to save these orcas from extinction since 1993. You can contribute to protecting these orcas by signing and sharing the petition and through making a donation to Lifeforce Foundation through Paypal.Donate to Paypal.